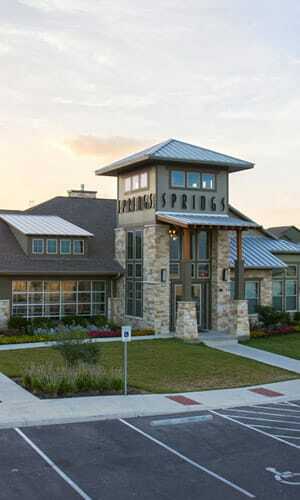 For those seeking a luxury apartment community in a premier location, Springs Apartments is here to welcome you home. As a corporate leader in the community, it’s important for you to know that Springs is owned and managed by Continental Properties, a leading owner, developer and operator of luxury multi-family apartment communities throughout the country. Continental Properties believes that every Springs project is a long-term investment - both for the company and for the communities that we serve. The award-winning Springs Apartments, our national brand of gated apartment communities, are designed to offer an attractive housing option. Each community is meticulously maintained and features an array of amenities designed to bring you the comfort you deserve. The Springs offer a unique condominium-style approach to apartment living with our signature two-story, townhome-style private entrance apartments and available attached and detached garages. The adaptable community design features natural exterior finishes and indigenous plants to compliment the surrounding landscape while the innovative interior space-planning showcases practicality, privacy and peace of mind. Ask us about our Springs Pledge. We promise outstanding customer service and we want you to hold us to that promise. In addition to outstanding customer service and maintenance teams, we also provide a helpful array of resources and moving guides, calculators, and resident services forms on each of our websites. When you choose to lease an apartment from Springs Apartments, we treat you to more than your average apartment community. Visit our individual location pages to learn about the perks we can offer you. Would you like to grow your career in the multifamily industry? Let us help. Springs Apartments is owned and operated by Continental Properties, a 5-time Top Workplace award-winning employer based in Milwaukee, WI. We are always looking for talented members to join our growing team.